Presentation is essential to every foodservice establishment, especially when the food is on display to the guests. Help your menu offerings look their best with concession supplies that get the job done. Keep food organized, attractive, and fresh with our selection of quality concession supplies. Pizza, pretzels, sandwiches, and snacks look good, smell good, and sell good when they are on display. These merchandisers give you a variety of ways to enhance food presentation, while keeping it warm for faster customer service. In convenience stores, at sports stadiums, and cafeterias hot dogs are a popular food choice. Our griddles, rollers, and steamers make it easy offer hot dogs to your customers. From a simple broiler, to a self-serve roller griddle with a bun warmer and sneeze guard, hot dogs are the way to go. Easily store, display, and warm nacho chips and pretzels with our attention-grabbing clear glass cabinets. When customers are hungry and want something fast, these foods fit the bill, and you’ll have them in clear view and ready to serve in these warmer/display cabinets. It’s a smell that is instantly recognizable – popcorn. Whether at the movies, the game, or the mall, popcorn is always a favorite. These attractive, countertop popper/warmers make it easy to keep the kernels popping. 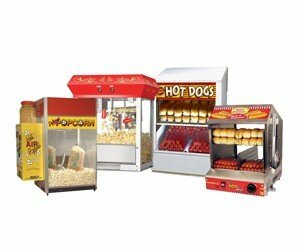 Available in a number of sizes and colors so your customers can enjoy fresh, delicious popcorn almost anywhere. A commercial soup warmer makes it easy to hold food at a safe temperature for extended periods of time. Great for soup, stew, chili, or sauce a soup warmer can be used in the kitchen or dining room. These warmers are compact and attractive enough for buffets, catering events, cafeterias, and other self-serve applications. Available in various sizes, warming capacities, and styles to find your needs – large or small.